Kershaw Knives takes great pride in pushing the envelope in blade technology. To showcase their award-winning knives, their website had to be unique yet intuitive in order to maintain focus on the beauty and craftsmanship of the knives. 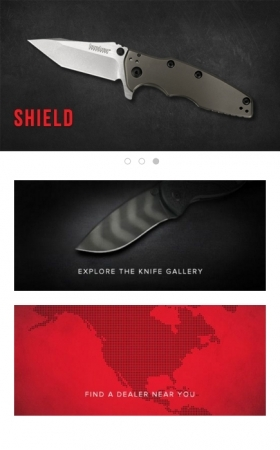 The Kershaw Knives website pushes ecommerce to the next level, driving sales while creating an exclusive, gallery feel. With innovative responsive design, this website looks equally stunning whether the customer shops on a desktop computer, tablet, or mobile phone. 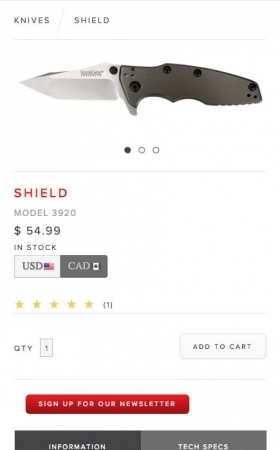 In order to cross-promote Kai's other knife brands to loyal Kershaw fans, the Kershaw site features custom shopping cart technology to allow for a combined purchase between Kai's other brands: Shun Cutlery, Kai Housewares, and Zero Tolerance. The new Kershaw site featured a new style guide and customer profiles to leverage the branding Kershaw had already invested in, but modernize it for the web. An additional challenge was to ensure all Kai's brands had cohesive branding to tie them together while also ensuring they can stand alone. 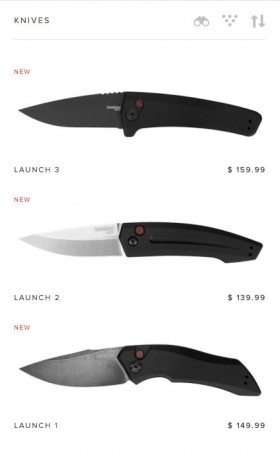 Here, we see Kershaw's dark and red aesthetic applied to differentiate from the other Kai brands. As a manufacturer selling online, the Kai brands have the opportunity to reach core audiences though digital advertising channels. Like what we did for Kershaw Knives?